Bury remain the most dominant sides in the division, with league leaders Lincoln occupying a far more modest area of the graphic. Quality trumping quantity is at least a partial explanation here, as the rest of the charts will show us. MK Dons are the undisputed entertainers of the division, with an average of almost 27 shots in their matches this season. Despite sitting in the mid-table, Grimsby and Stevenage have done far more defending than attacking this season. Cambridge and Lincoln are polar opposites here: the Imps lead the division despite creating relatively few chances because they’re absolutely ruthless at converting the ones they do carve out. 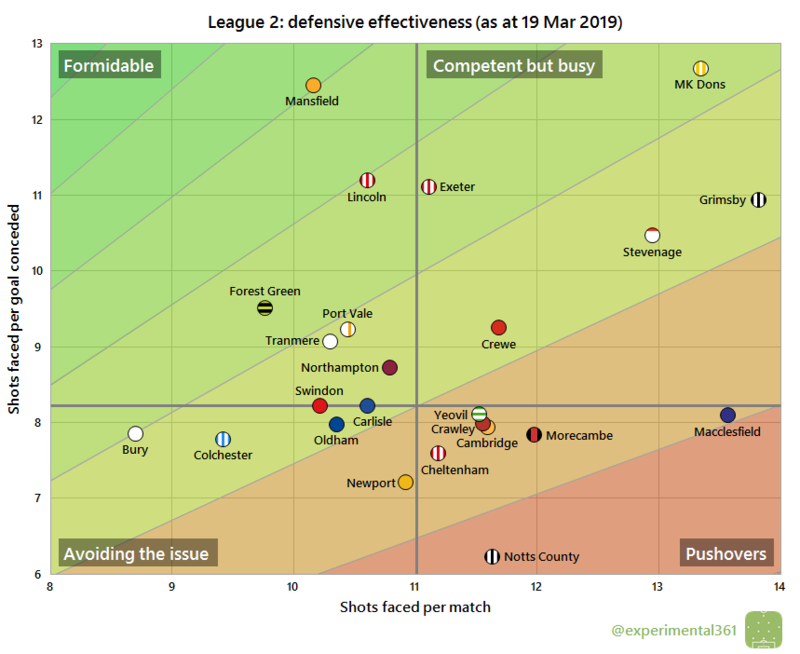 Cambridge meanwhile have one of the most productive attacks in the division but their finishing has been woeful: they’ve needed more than twice as many attempts on average to put the ball in the net. Port Vale have also struggled to turn a relatively respectable number of opportunities into goals. 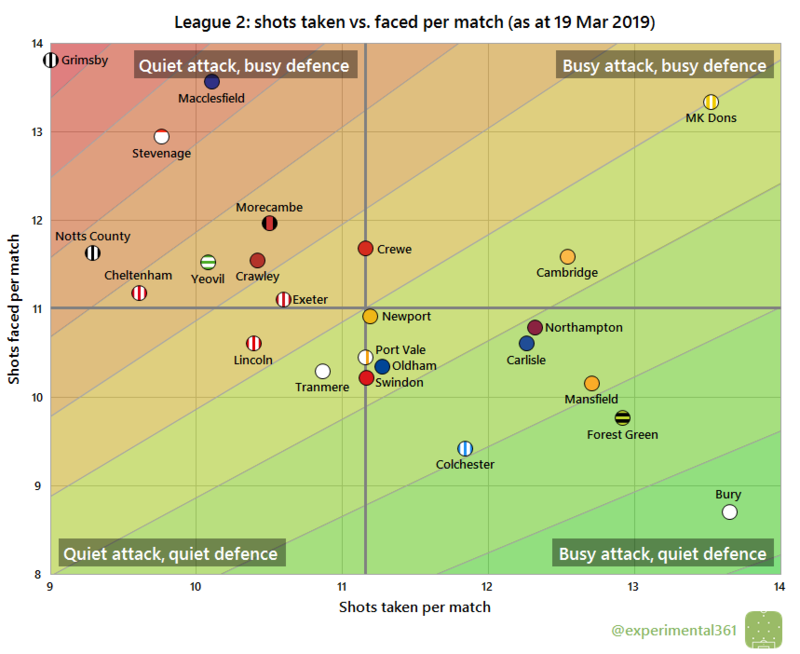 Mansfield and MK Dons have both got their stubborn defences to thank for sustaining their promotion campaigns, while Grimsby have gotten away with allowing the most shots in the division by far due to their tenacity at keeping the ball out of their net. Bottom side Notts County haven’t allowed opponents a ridiculous number of opportunities but they’ve been the worst by far when it comes to repelling shots. 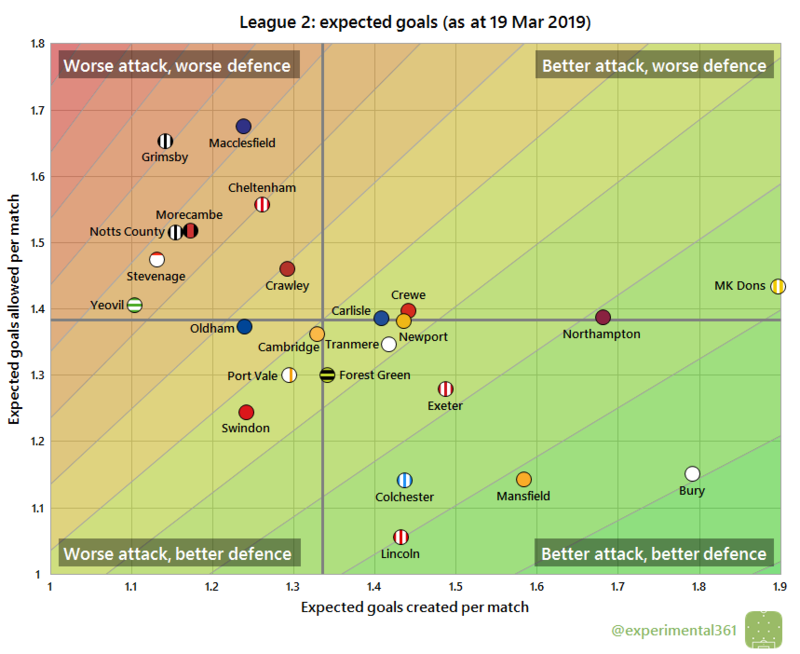 When we adjust for shot quality – at least as well as I’m able to measure it – then Grimsby stand out as the worst-performing side, so I’m not sure how they’re sitting so comfortably in mid-table. It could be that their poor start is skewing the numbers, but if things stay the same then I’d expect them to drop a bit before the end of the season. 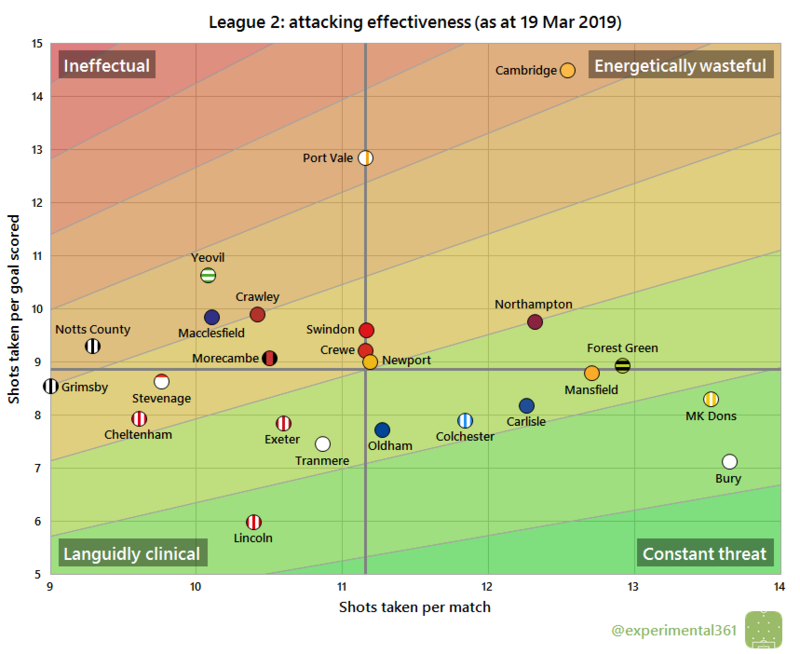 Bury look to be the strongest side overall, although MK Dons, Mansfield and Lincoln aren’t far behind overall – the Imps are far more impressive at the back than up front, while the opposite is true of Paul Tisdale’s side.